Tenbatsu Angel Rabbie Wallpaper: ..Wonders.. 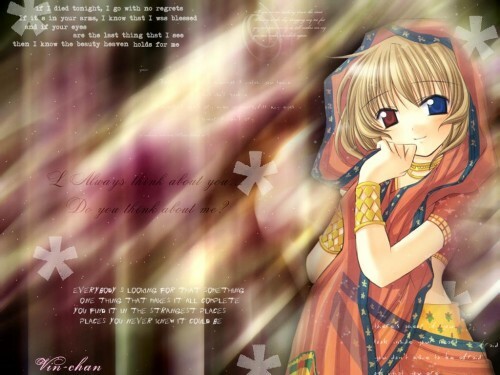 Minitokyo »	Tenbatsu Angel Rabbie Wallpapers » Tenbatsu Angel Rabbie Wallpaper: ..Wonders.. I took several of layers...I know the picture is blur...is because of the whit effect... >_<i like the white efect..I think i have to quit that addict..
Is a character from Angelic Serenade..Althought i havent watch the movie yet But i think this character had say the wordings above. very nice...you got the bg from the texture section in Aethereality.net right.....^_^ you must mention it...Overall I think your improving alot....See yah! Owh..I think so..=P...Now can you teach me how to edit the words..? Nice character, and I like the wording / quotes, esp the scribble at the bottom right. The girl is very pretty but I think your background has overwhelmed her. Still, it's a good effort. Thanks for sharing.